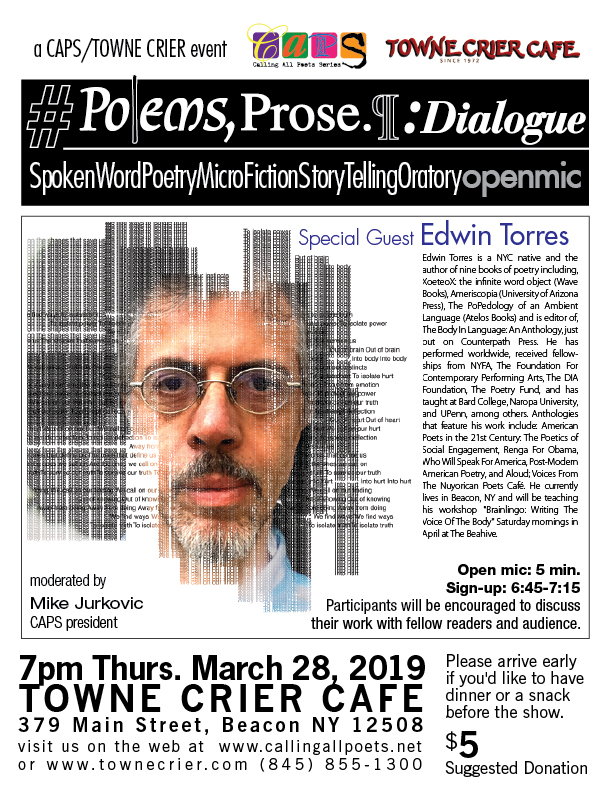 Edwin Torres brings his audio-visual-body-lingo to Calling All Poets #poemsprosedialogue in celebration of his recent book, “Xoeteox: the infinite word object” (Wave Books). Calling All Poets #wordsmusicdialogue has morphed by demand into #poemsprosedialogue, presenting a new twist on the traditional poetry open mic by fusing live readings by writers of prose and poetry with a living room discussion between the writers and their audience. Edwin will engage, reveal, entertain and then open the floor to the audience. Moderated by Calling All Poets' Mike Jurkovic & Jim Eve. Open mic participants will be encouraged to join in the discussion and salon. Sign up for open mic is 6:45 -7:15. First six signees will perform for 5 minutes each. A suggested $5 donation empowers CAPS (a 501c3 non-profit organization) to further broaden its endeavors to nurture the spoken word and guarantee an open, democratic forum for free speech throughout our region. Edwin Torres has performed worldwide, received fellowships from NYFA, The Foundation For Contemporary Arts, The DIA Foundation, The Poetry Fund, and has taught at Bard College, Naropa University and UPenn, among others. Anthologies that feature his work include: “American Poets in the 21st Century: The Poetics of Social Engagement,” “Who Will Speak For America,” “Post-Modern American Poetry” and “Aloud; Voices From The Nuyorican Poets Café.” His other books of poetry include “Ameriscopia” (University of Arizona Press), “The PoPedology of an Ambient Language” (Atelos Books) and he’s editor of “The Body In Language: An Anthology” just released by Counterpath Press.